If you work with content in the raw HTML editor, then switch to the visual editor, custom HTML can be lost. If you need to create custom HTML, we recommend that you start by using the visual editor, and then switch to the raw HTML editor when you are ready to add the custom HTML. Select a formatting style for the selected text, such as paragraph, preformatted (monospace), or a heading level. The available heading levels in the HTML component editor begin with heading 3 (<h3>). HTML components are part of a complete page, and elements outside the HTML component use heading levels 1 and 2 by default. Because tools such as screen readers use heading levels to navigate through pages, using heading levels 1 or 2 inside an HTML component can interfere with the functionality of these tools. Select a font family for selected text, such as Arial, Courier New, or Times New Roman. Format the selected text in bold, or remove this formatting. The editor inserts <strong> tags around the selected text. Format the selected text in italics, or remove this formatting. The editor inserts <em> tags around the selected text. Underline the selected text, or remove this formatting. The editor encloses the selected text in the tag <span style="text-decoration: underline;">. Change the color of the selected text. The editor encloses the selected text in the tag <span style="color: color-hex-code;">. Align text and images to the left. The editor adds style="text-align: left;" to the <p> tags that surround the text. Center text and images. 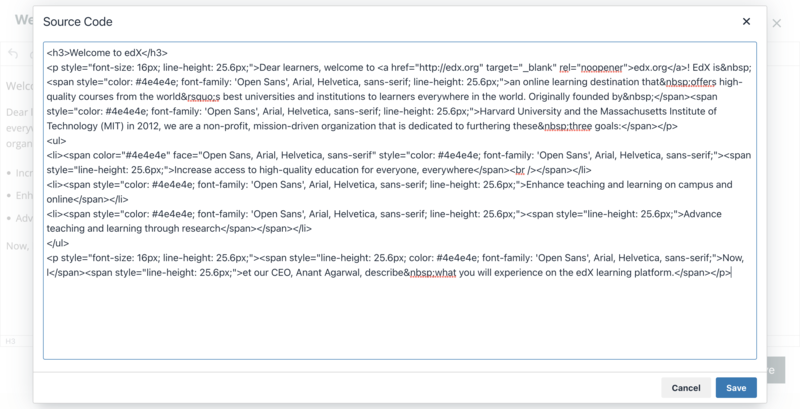 The editor adds style="text-align: center;" to the <p> tags that surround the text. Align text and images to the right. The editor adds style="text-align: right;" to the <p> tags that surround the text. Justify text and images. The editor adds style="text-align: justify;" to the <p> tags that surround the text. Decrease and increase the indentation of the selected paragraph. Create a hypertext link from the selected text. For more information, see Add a Link in an HTML Component. Insert an image at the cursor. For more information, see Add an Image to an HTML Component. When you add a heading to an HTML component, make sure that you use only heading level 3 <h3> through heading level 6 <h6>. HTML components are part of a complete page, and elements outside the HTML component use heading levels 1 and 2 by default. Because tools such as screen readers use heading levels to navigate through pages, using heading levels 1 or 2 inside an HTML component can interfere with the functionality of these tools. Enter and format your content. You can review the HTML markup. To enter a display name for the component, select Settings, and then enter text in the Display Name field. Each HTML template supplies a default display name. Changing the default to a unique, descriptive display name can help you and your learners identify course content quickly and accurately. If you delete the default display name and do not enter your own identifying name, the platform shows “Text” as the name of the component. When you use the visual editor, you can also perform the following tasks. When you create an HTML component, you select one of the following templates. When you use the visual editor, to add a link to a website, course unit, or file in an HTML component, you work with the Insert link dialog box. In the Insert link dialog box, enter the URL of the website that is the destination for your link in the URL field. When you create a link to another component, the unit of that destination component must be published for the link to work. 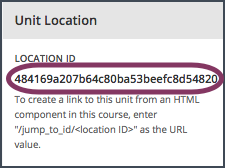 Obtain the location ID of the unit you want to link to. In Studio, open the page for the unit that you want to link to in Studio, and then locate Unit Location in the right pane. Under Unit Location, select and copy the alphanumeric text in the Location ID field. In the Insert link dialog box, enter a value that resembles the following value in the URL field. Make sure to replace <location ID> (including the brackets) with the location ID that you copied in step 1, and make sure that you include both forward slashes (/). Ensure you use /jump_to_id/<location ID> as the URL value. Do not use the URL of the unit that you see in the browser address bar. If you do not use /jump_to_id/<location ID>, the link will be broken if you export and then import the course. When you add links to files, open the HTML component and the Files & Uploads page in separate browser windows. You can then more quickly copy file URLs. Do not use this method to add images to HTML components. Instead, use the method in Add an Image to an HTML Component. On the Files & Uploads page, locate the file that you want, and then select Studio in the Copy URLs column. You must use the Studio URL to link to the file, not the Web URL. For more information, see Adding Files to a Course. In the toolbar, select the link icon. In the Insert link dialog box, paste the Studio URL for the file in the URL field. For example, the URL might resemble the following URL. Make sure that you include both forward slashes (/). (optional) If you want the link to open in a new window, select the dropdown arrow next to the Target field, and then select New Window. If not, you can leave the default value. When you use the visual editor, you can add any image from your computer to an HTML component. You can see a preview of the image before you add it to the component. Before you add an image, make sure that you obtain copyright permissions for images you use in your course, and that you cite sources appropriately. To add effective alternative text for images, review Use Best Practices for Describing Images. You can only add one image at one time. Each individual image file must be smaller than 10 MB. To add an image to an HTML component, you can use one of the following procedures. Drag an image from your computer into the Add Image dialog box in the HTML component. Locate an image by using the Browse Your Computer option in the Add Image dialog box. Select an image that you have uploaded to the Files & Uploads page. In the HTML component, position the cursor where you want to add an image, and then select the image icon on the toolbar. In the Add an Image dialog box, drag an image from your computer into the Drag and Drop area. As soon as your file uploads, the Edit Image Settings dialog box opens. In the Edit Image Settings dialog box, add an image description. In the Image Description (Alt Text) field, enter alternative text for the image. This text becomes the value of the alt attribute in HTML and is required for your course to be fully accessible. For more information, see Use Best Practices for Describing Images. If your image is a decorative image that does not convey important information, select the This image is decorative only checkbox. (optional) Specify the width and height of your image. For more information, see Change the Image Size. In the Add an Image dialog box, Browse Your Computer. In the dialog box that opens, locate the file that you want to add, and then select Open. If you have not already added the image that you want to add, open the Files & Uploads page, and then upload the image. For more information about uploading images, see Adding Files to a Course. When you upload an image, the image automatically becomes available in a list that opens when you add an image to an HTML component. In the Add an Image dialog box, locate the image in the Select a previously uploaded image list, and then select Next. In the Edit Image Settings dialog box, complete one of the following options. You have several options for formatting an image in an HTML component. To align your image to the right, the left, or the center, follow these steps. In the HTML component, select the image. On the toolbar, select the left align, right align, or center icon. To change the size of your image, follow these steps. In the HTML component, select the image that you want to edit, and then select the image icon on the toolbar. In the Edit Image Settings dialog box, locate Image Dimensions, and then enter the values that you want for the Width and Height options. To make sure that the image keeps the same proportions when you change the image size, make sure that Lock proportions is selected, and enter a number in only the Width field or the Height field. After you tab or click outside that field, the number in the other field changes to a value that maintains the image proportions. If you want to change the image back to the original size, clear the values in the Width and Height fields. You can import LaTeX code into an HTML component. You might do this, for example, if you want to create “beautiful math” such as the math in the following image. The LaTeX processor that Studio uses to convert LaTeX code to XML is a third party tool. We recommend that you use this feature with caution. If you use the tool, make sure that you work with your partner manager. Select Edit to open the new component. At the bottom of the component editor, select Launch Latex Source Compiler. Add your LaTeX code. To do this, complete either of the following procedures. 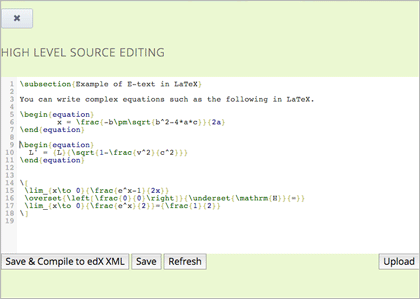 In the High Level Source Editing field, add your LaTeX code. 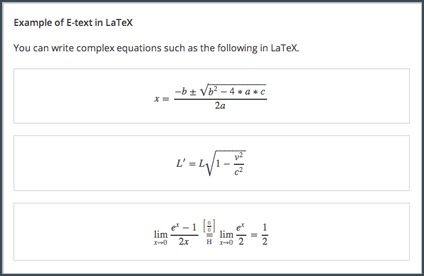 To upload a LaTeX file from your computer, select Upload. Select Save & Compile to edX XML. On the unit page, select Preview to verify that your content looks correct in the LMS. If you see errors, go back to the unit page. Select Edit to open the component again, and then select Launch Latex Source Compiler to edit the LaTeX code.